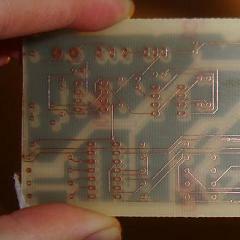 This PyroElectro tutorial shows you have to step beyond making simple 1 layer PCBs and how to make your own 2 layer PCBs at home, completely DIY. The example design is a simple LED flashing circuit, but it requires 2 layers. Take a look and see how it’s made. Thanks and yeah, luckily it’s pretty easy to find 2 layer boards in stores still. Give it a shot or two. Just start off with smaller boards. Would drilling out two of the vias on opposite corners (like fiducials) and using them to line up the designs work for alignment? I would imagine if you held the paper up to the light, you could see though and line it up. I would try this, but I am not yet up to etching my own boards. Yea, drilling out Vias or any holes you have in your board helps immensely in lining things up for the 2nd layer toner transfer. I actually did this for the next project I’ll post this week (3/17). You can then cut out the drill holes in your toner transfer paper and line things up virtually perfectly.